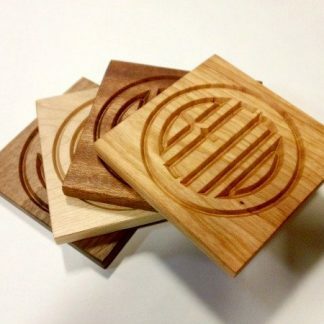 We’ve engraved the iconic BEND logo into four different woods (top to bottom- Cherry, Mahogany, Maple and Walnut) that you can mix or match into a beautiful set of four coasters. Let us know your wood preference in the special instructions box. Hardwood coasters are just under 4″ square and 1/2″ thick with a hand rubbed finish.